Convert all existing paper charts and diagrams to electronic form with this easy to learn program. Just scan the graph, open the image in Graph Converter Lite, calibrate, and the modern algorithm for automatic graphs recognition creates the tables automatically. May be programmed to ignore noise on the image, cutting down on wasted paper. You may also manually chart point placement and edit points, also automatic. Graph Converter Lite software is able to convert graphs on paper into a vector form and create a corresponding data points table. You can convert existing paper charts and diagrams to electronic form with this software. There is not much learning involves when trying to use the program. 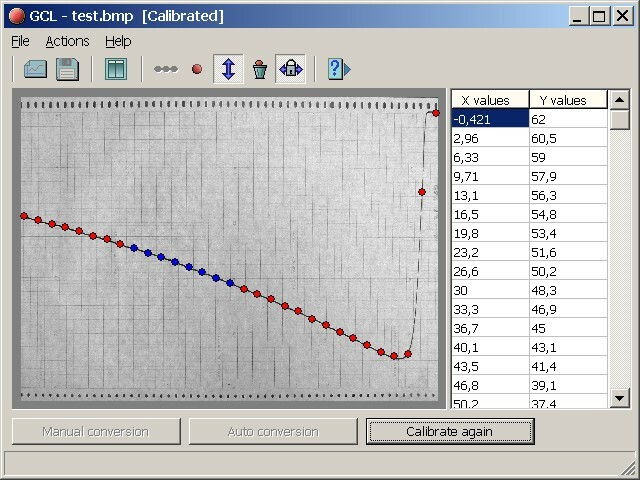 All you really need to do is scan the graph and then open the raster image in the Graph Converter. Once you have calibrated the utility a table of data points is created automatically and a vector drawing of the graph also is created. Qweas is providing links to Graph Converter Lite 2.2 as a courtesy, and makes no representations regarding Graph Converter Lite or any other applications or any information related thereto. Any questions, complaints or claims regarding this application Graph Converter Lite 2.2 must be directed to the appropriate software vendor. You may click the publisher link of Graph Converter Lite on the top of this page to get more details about the vendor.